In the latest installment of Common Core IRL: In Real Libraries, we focus our attention on books about Colonial America and the Revolutionary War. Be sure to visit the following blogs this week to read all of the reviews. Upper elementary classes usually study Colonial America and the American Revolution. Many books about the American Revolution are written from the point of view of the patriots who were upset with taxes and the way Great Britain governed the colonies. However, George vs. George is a more balanced look at the events leading up to the American Revolution and the consequences of the war. By writing from different points of view, Schanzer gives children a more accurate view of complex historical events. 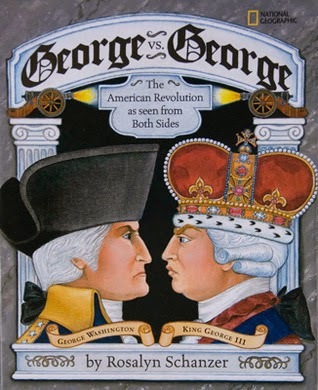 The narrative writing style and picture book format of George vs. George make it a text that could be read aloud or used as an independent reading book in social studies classes. The lengthy bibliography and source notes might lead readers to other sources for further reading and research including a study of primary vs. secondary sources. R.I. 5.6 Analyze multiple accounts of the same events or topic, noting similarities and differences in the point of view they represent. Rosalyn Schanzer provides readers with two different points of view: one from George Washington and the rebels and the other from King George. George vs. George outlines the events leading up to the war while offering a balanced view of these events. Readers could compare and contrast the lives and motivations of King George to George Washington in a written assignment or in an oral presentation or speech. Readers might also identify how each side reacted to events and battles and use evidence from the text to explain why this was the reaction. For example, after Washington's troops defeated the British at Saratoga, "King George tried so hard to make merry in public that he embarrassed all his friends" (p.43). R.I. 5.1 Determine two or more main ideas of a text and explain how they are supported by key details; summarize the text. The book is organized into chapters that progress chronologically. Readers could identify the main ideas from each chapter using evidence from the text to support their thinking. Schanzer's folk art style illustrations painted on a textured canvas incorporate cartoon elements including speech balloons with actual quotes from historical figures. These quotes connect directly to the events on each page and may help readers interpret how different sides of the conflict viewed the events. R.I. 5.3 Explain the relationships or interactions between two or more individuals, events, ideas, or concepts in a historical, scientific, or technical text based on specific information in the text. Readers may explain the relationship between the British government to the government of the American Colonies based on the information on pages 16-17. Students could create their own graphic organizers comparing the government of England to the government of the American Colonies. Students could also explain the relationship between the Sugar Act & Stamp Act, the Boston Tea Party, and the closing of Boston Harbor. Some sections of the book provide readers with opportunities to compare and contrast, such as the equipment, size and tactics of British troops vs. Rebel troops. Schanzer packs a lot of information into the pages of this informational picture book that will help readers see the American Revolution from different perspectives. By sharing texts that examine historical events from different points of view, we help our children become critical thinkers and consumers of information. View a video of Rosalyn Schanzer reading aloud from George vs. George.